Actually, there are a variety of accommodations in Bromo that can be selected by the foreign and domestic tourists starting from the inn such as Hotel of Bromo Permai 1 to the guesthouse that deliberately prepared for visitors coming from the entourage. The price of the hotel depends on each financial. Conversely, there is also specialty that is simple and cheap for hotel in around Bromo. Therefore, the tourist must be smart in choosing the best hotel, recommended hotel with the great facilities and the low price. Bromo is famous for sunrise where visitors must leave their preparation since 2 a.m. Choosing inns or hotels or even guesthouses in Bromo is a must thing to do, because visiting Bromo need more than a day. And the smart choice is choosing the hotel that close to the destination. It will need less expense by choosing the hotel that is near the mountain, because the tourists don’t need to look for other transportation to Bromo Mountain. This is one of the hotels in Probolinggo, East Java. The location is near Bromo Mountain, 100 meters from Cemara Indah Hotel. This is a one star hotel that is located in Cemoro Lawang Street, Ngadisari, Bromo Mountain, Probolinggo, East Java, Indonesia. This hotel has the altitudes ranging position at 2.300 above sea level and the average of minimum temperature is 5°C until 20°C. It is owned by Bromo Permai Group. 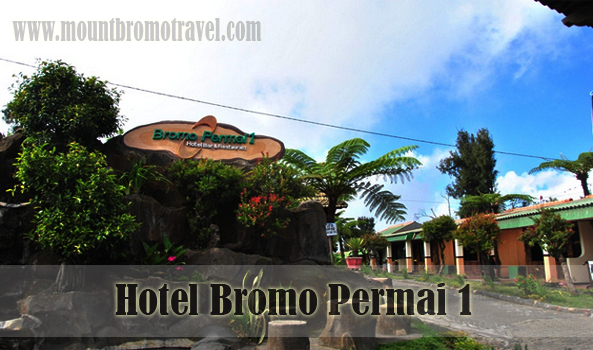 In addition to the Hotel of Bromo Permai 2 is located in the town of Probolinggo, East Java. Hotel of Bromo Permai 1 is one of the closest hotels to the area of Mount Bromo which is a national park Bromo Tengger Semeru and it is facing directly into the tourist area of Mount Bromo. So to see Mount Bromo, tourists can stand in front of the hotel exactly. Because of the strategic location, it makes this hotel is recommended to the domestic and foreign tourists who are on vacation to Bromo. This hotel offers various facilities to the convenient of the customer. This hotel provides the airport shuttle transportation, a restaurant with free Wi-Fi, room service, laundry service, rental, a spacious car park, and cash and credit card system. More than that, this hotel is completed with several types of rooms such as the standard room with twin, double, and triple beds, VIP triple, Family room, and cottages with total 44 rooms. And each room in Hotel of Bromo Permai 1 is completed with bathroom with hot water, TV cable, mineral water, and many more.